It is often remarked that 'dogs look like their owners'. Might there be more to the assertion than believed? A new research project at the University of Copenhagen will examine the DNA of prehistoric dogs and humans to identify shared traits and differences in the genetic development of these two species. 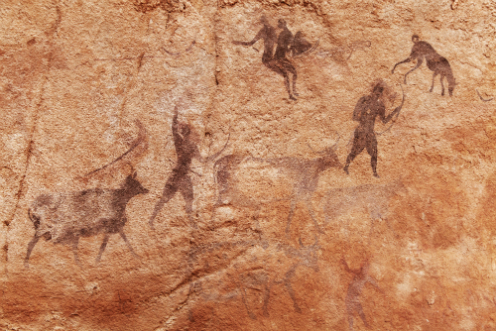 Prehistoric rock paintings of Tassili N'Ajjer, Algeria, depicting human hunters and a dog. Dogs and humans have stood side by side for at least 15,000 years, populating planet Earth's most inhospitable corners, suffering through epidemics and adapting to climatic changes. Recently, researchers discovered that a genetic mutation that allows Tibetan people to survive at high altitudes exists in Tibetan Mastiffs as well. Both have adapted to their harsh surroundings over many generations. A new research project at the University of Copenhagen’s Natural History Museum of Denmark will look for similarities in the evolutionary development of humans and dogs by analyzing DNA samples from the last 15,000 years. The Villum Foundation's 'Young Investigator Program' has granted nine million Danish kroner to the project. "We want to track the evolution of genetic traits in dogs and humans – two species that have lived close to one another for thousands of years, species that have settled in a very wide range of environments across the planet. From the Siberian tundra to tropical Southeast Asia, they have most likely had to adapt in order to survive," says Assistant Professor and head researcher Fernando Racimo of the Natural History Museum of Denmark. The project is a collaboration with the University of Oxford and Queen Mary University of London, who, over the last few years have collected hundreds of samples from ancient dog skeletons with the help of archeologists in Europe and Asia. Alongside the analysis of ancient dog samples, researchers will also look at DNA samples from similarly dated human remains. It is the first time that such a comparison will be researched. "This is the first time that anyone has systematically looked at the genetic development of these two species, which have been living side by side for thousands of years. It also marks the first occasion that research is attempting to track various environmental changes including climate, disease and so on, and compare these changes with the genetic development of dogs and humans," explains Racimo. According to Racimo, previous research was largely limited to ancient genes that had a "major impact" on human development – the LCT gene for example. The LCT gene controls lactose tolerance and played a central role in human evolution, during the advent of farming 5000 years ago. Previous projects have used the LCT gene to date the rise of human agriculture. In this project however, researchers will focus on more "complex traits", such as height, weight and other characteristics that might shed light on development, and are affected by many different genes across the genome. "The project is basic research, so our results will produce new knowledge about evolution to help us understand the adaptations that have been important for dog and human survival in the past," concludes Fernando Racimo.